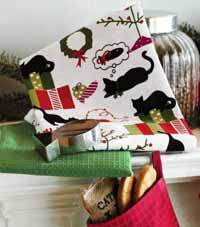 Christmas Linens at The Weed Patch! 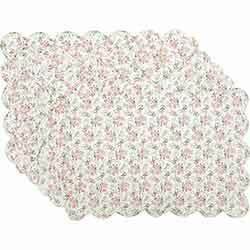 Tablecloths, runners, dishtowels, oven mitts, pot holders, napkins, placemats, pillows, tree skirts, and more by companies such as Tag, Design Design, Victorian Heart, DII, India Home Fashions, Raghu, and more! 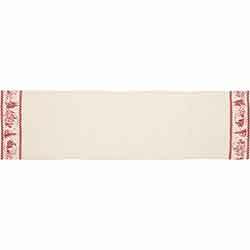 Alpine Napkin, by Tag. 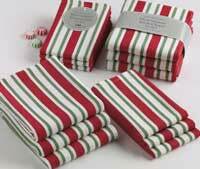 Red striped holiday napkins, 100% cotton. Machine wash cold separately; tumble dry low. Measures 20 x 20 inches. 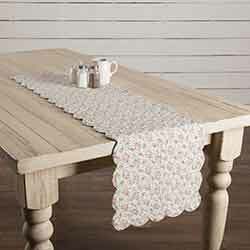 Alpine Napkin, by Park Designs. 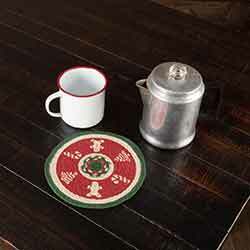 The Alpine Collection features a plaid of Christmas red, green, and white. This is for the Napkin. Measures 18 x 18 inches. 100% cotton. Machine washable. Other coordinating linens also available! The Alpine Collection features a plaid of Christmas red, green, and white. This is for the Pot Holder. 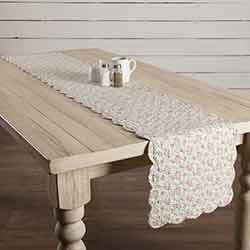 Alpine Table Runner, by Park Designs. 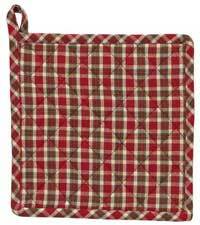 The Alpine Collection features a plaid of Christmas red, green, and white. 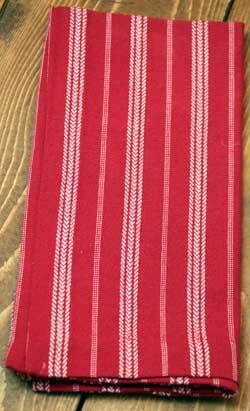 This is for the 54 inch Tablerunner, which is woven-style, with fringe on each end. Measures 13 x 54 inches. 100% cotton. Machine washable. Other coordinating linens also available! 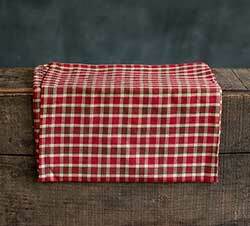 Bayberry Napkin, by Park Designs. 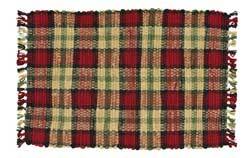 The Bayberry Collection features a plaid of red, black, tan, and sage green. This is for the Napkin. Measures 18 x 18 inches. 100% cotton. Machine washable. Other coordinating linens also available! 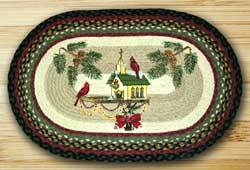 Burgundy, Gray, and Creme Braided Jute Christmas Tree Skirt, by Capitol Earth Rugs. 100% natural jute tree skirt, dyed and braided. 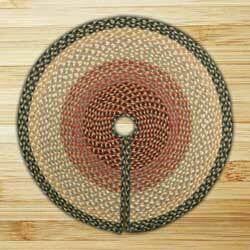 Measures 30 inches in diameter. Jute is a natural fiber, considered to be sustainable, and environmentally friendly. Naturally water repellent, safe to put near a fireplace, spot clean with soap and water (or dry clean). 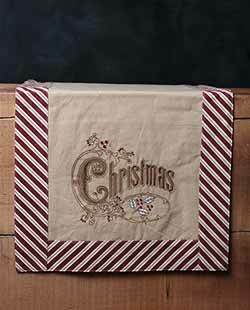 Wintery antique color is paired with soft burlap to give the Vintage Burlap Placemat Set a Christmas-inspired look alive with country splendor. 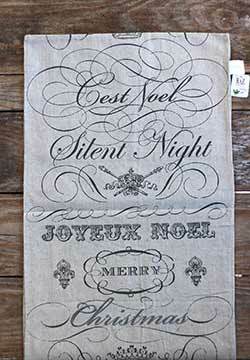 Made of beige colored burlap with black printed scroll lettering. Measures 72 x 14 inches. 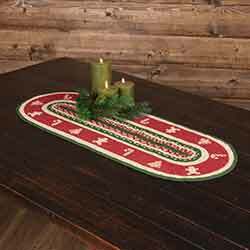 The Cabin Christmas 36 inch Table Runner features stenciling reminiscent of rustic villages found in the Swiss Alps along each side. Candy Cane Santa Oven Mitt, by Kay Dee Designs. 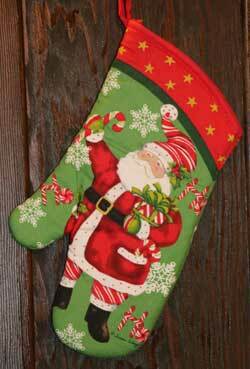 This festive oven mitt features the Santa artwork of Susan Winget. Measures 13 inches long. 100% cotton. Machine washable (see label for care instructions). 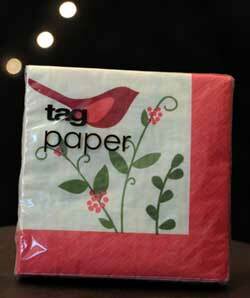 Cardinal & Sprig Paper Cocktail Napkins, by Tag. Part of the Holiday Song Collection. 3-ply paper. Printed with water-based inks. Odorless and environmentally safe. Cello wrapped. 20 napkins per package. Measures 9.875 x 9.875 inches. Cardinal and Sprig Embroidered Cocktail Napkin, by Tag. 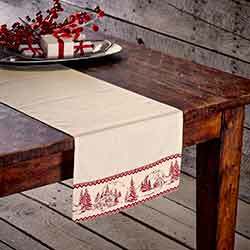 Beautiful ivory cotton cocktail-sized napkins with decorative red scalloped edging and embroidered cardinal and winter sprig design. Sold individually. Part of the Holiday Song Collection. 100% cotton. Machine wash cold separately; tumble dry low. Measures 10 x 10 inches. 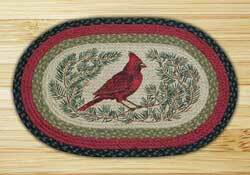 Cardinal Oval Patch Braided Rug, by Capitol Earth Rugs. Artwork designed by Phyllis Stevens. Measures 20 x 30 inches. Made of 100% natural jute. 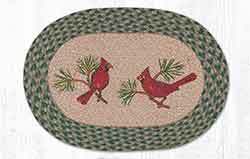 Cardinals Braided Jute Rug, by Capitol Earth Rugs. 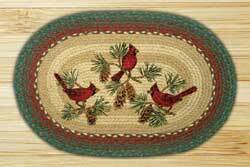 Features stenciled designs of beautiful cardinals, with braiding in reds and green. Designed by Harry W. Smith. Measures approx 20 x 30 inches. Jute is a natural fiber, considered to be a sustainable, environmentally friendly material. Water repellant, safe to put near a fireplace, spot clean with soap and water (or dry clean). As with all dyed jute products, take care to use a pad or otherwise protect items used with them, as colorfastness can be an issue. 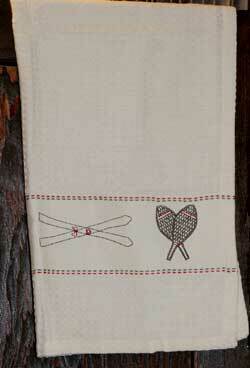 Chalet Napkin with Embroidery, by Tag. 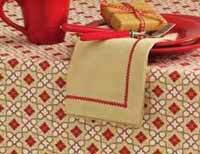 Cream-colored napkin with red zig zag embroidery. Part of the Chalet Collection. Measures 20 x 20 inches. 100% cotton, machine washable. Chalet Noel Paper Cocktail Napkins, by C.R. Gibson. Features a reproduced image of green and red snowflakes against a white background. This is for the Paper Napkins in the Cocktail/Beverage Size. Measures 5 inches square (folded). 3ply, 20 napkins per pack. Printed in the Germany, made of recycled materials. Chocolate Holiday Paper Cocktail Napkins, by C.R. Gibson. Features a reproduced image of holiday chocolate candies and chocolates. This is for the Paper Napkins in the Cocktail/Beverage Size. Measures 5 inches square (folded). 3ply, 20 napkins per pack. Printed in the Germany, made of recycled materials. 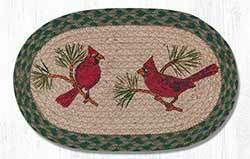 Christmas Birdhouse Oval Patch Braided Rug, by Capitol Earth Rugs. Measures 20 x 30 inches. Made of 100% natural jute. 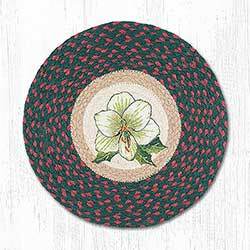 Christmas Bliss Placemats, by India Home Fashions. 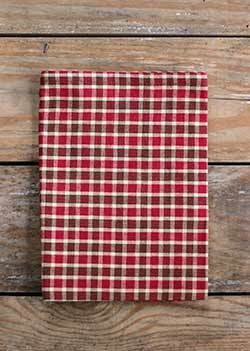 The Christmas Bliss pattern features a simple primitive checked pattern in Christmas green, red, and tea-dyed cream. This is for the Pot Holder, which measures 9 x 9 inches. Also available in napkins, dishtowels, and table runners! 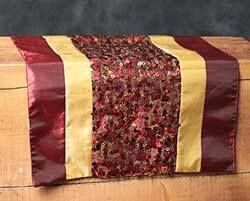 All India Home Fashions linens are hand-stitched (so some slight variations may occur), and are of excellent quality. We love all their country, primitive, and colonial looks! 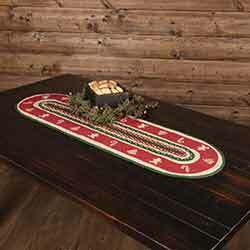 Christmas Candy Cane Table Runner, by Raghu. 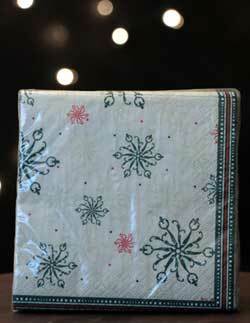 Tea dyed tan cotton dishtowel with detailed embroidery holly leaves and berries, and "Christmas" in an old world font. 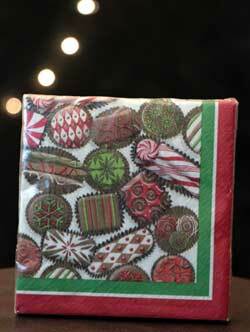 Bordered with a candy cane striped fabric. Measures 14 x 36 inches. Perfect for that old world Christmas! 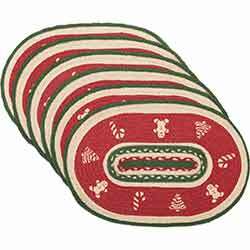 Christmas in Bloom Braided Chair Pad, by Capitol Earth Rugs. Features stenciled amarylis image, for winter or Christmas! Braiding is in muted red and green.